Messi: "I don't like promoting myself like Cristiano Ronaldo does"
29.06.2011 » Messi: "I don't like promoting myself like Cristiano Ronaldo does"
Lionel Messi granted an interview to "El País" and when asked about Cristiano Ronaldo, he simply said that he doesn't appreciate being the center of attentions. Messi also confessed that he dislikes being compared with CR7, justifying it with the same argument that Ronaldo used a few days ago: "Each one has its own personality"
Messi started the interview by confessing his long term plans and his hopes of ending his career playing in Argentina, if he ever leaves Barcelona: "If I leave Barcelona, then I would probably return to Argentina and retire there." When asked if he would be willing to sign for Real Madrid and play side-by-side with Cristiano Ronaldo, Messi declined the idea: "No, I don't think so. I wouldn't switch for the other side. I'm very happy in Barcelona these days. I'm doing very well and that's where I want to play before returning to Argentina." 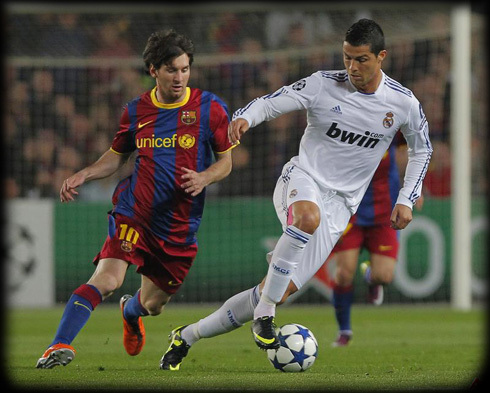 Messi also refuted the idea of being compared with Cristiano Ronaldo and simply said that they both have their own styles. "Each one has its own personality. I don't like promoting myself and exposing my image like Cristiano Ronaldo does, because that's not the kind of person I am. I'm more reserved than Ronaldo, I like being with my family and close friends, who have always been with me throughout my life. The media and newspapers publish a lot of non-sense things, about women and other stuff, but it's all lies."